Toshiba UPS Systems, manufactured by the Toshiba Power Electronics division, offer a versatile range of single-phase and three-phase uninterruptible power system (UPS) solutions and accessories hallmarked for outstanding performance and reliability. 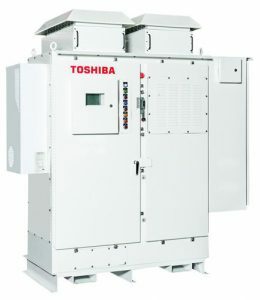 Toshiba UPS Systems offer mission critical power protection with their range of single-phase UPS models from 1 to 22 kVA. Their three-phase single module systems range from 13.5 to 2,000 kW, and three-phase parallel module systems are available in 90 to 16,000 kW. 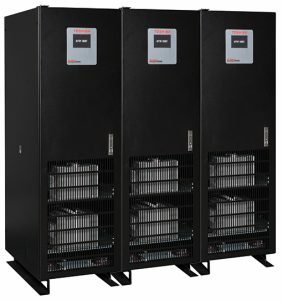 The 5000 Series is a rugged outdoor UPS designed to withstand the toughest environments. 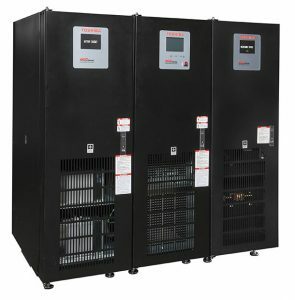 The Toshiba UPS line is suitable for a wide range of applications including data centers, telecommunication, retail, healthcare, broadcasting, and industrial. Toshiba International Corporation (TIC), headquartered in Houston, Texas, provides application solutions to a wide range of industries including general industrial, oil and gas, utilities, data centers, renewables, HVAC, water/wastewater, and mining. The Toshiba Power Electronics division has more than 25 years of experience in uninterruptible power systems and a history of reliability and quality. When you need to get the most out of every dollar in your budget, Toshiba UPSs are a smart investment. The Toshiba T1000 Series UPS 1-6kVA is a single-phase double conversion UPS that is designed for IT and retail installations. Reliable and efficient, the Toshiba T1000 Series features a 0.9 output power factor and is available in a range of sizes from 1 to 6kVA and supplies uninterrupted, clean single-phase power to critical systems. The Toshiba 1600XP/XPi Series is single-phase double-conversion UPS, available in a range of sizes: 3.6 kVA, 6.0 kVA, 8.0 kVA, 10.0 kVA, 14 kVA, 18 kVA, and 22 kVA. Available in a tower design solution with a LCD touch-screen display that provides unmatched access for UPS monitoring and control. 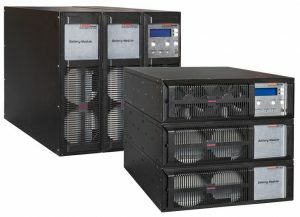 The Toshiba 4400 Series is the next-generation three-phase UPS. 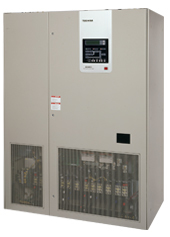 The double-conversion, all insulated-gate bipolar transistor (IGBT) 4400 Series UPS features a digitally controlled IGBT input rectifier, an intelligent low harmonic pulse-width modulation (PWM) output, state-of-the-art electronic battery isolation circuitry, and an easy to navigate local touchscreen interface. The Toshiba 5000 Series, industrial double-conversion Uninterruptible Power System is available in two configurations: a three-phase in, single-phase out 3P1 Solution and an all-new NEMA 3R Solution. 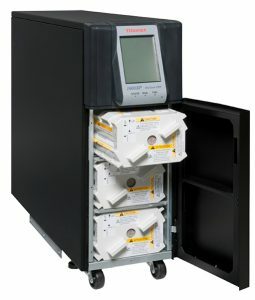 All Toshiba 5000 Series models feature industrial rated components: transistors, contactors, and capacitors designed for a 20-year lifespan as well as self-contained surge protection devices. The Toshiba G8000 Series UPS, 80-300kVA, is widely used in the medical industry where power protection is critical. The G8000 Series offers unity power factor output which provides 20% more power than other UPS manufacturers. 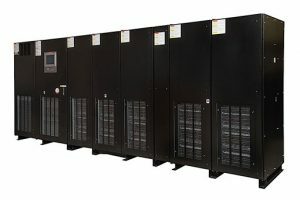 The G9000 Series UPS is available in capacities of 100, 160, 225, 300, 500, 750, 1000, 1330, 1500, 1600, and 2000kVA and comes with an industry-leading three-year onsite warranty. 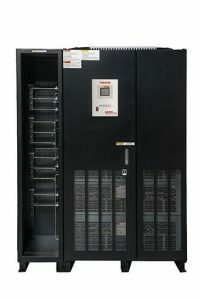 It is designed for stand-alone or parallel use in up to eight-unit configurations (100-1000kVA) or six-unit configurations (1330-2000kVA) without requiring the use of a special switchgear cabinet. The Toshiba G2020 Series UPS is one of the world’s first to utilize breakthrough silicon carbide (SiC) technology for improved performance. Advanced SiC power modules reduce conversion losses by nearly 50%, delivering an unprecedented 98% efficiency over a load range of 30-75%, while maintaining the same performance specifications as the renowned G9000 Series UPS. The Toshiba EL924 Series UPS is the next generation solution for the emergency lighting UPS market. As a Texas made, double conversion, all-IGBT UPS, the EL924 Series supplies the true sinewave power needed by the LED lights industry.